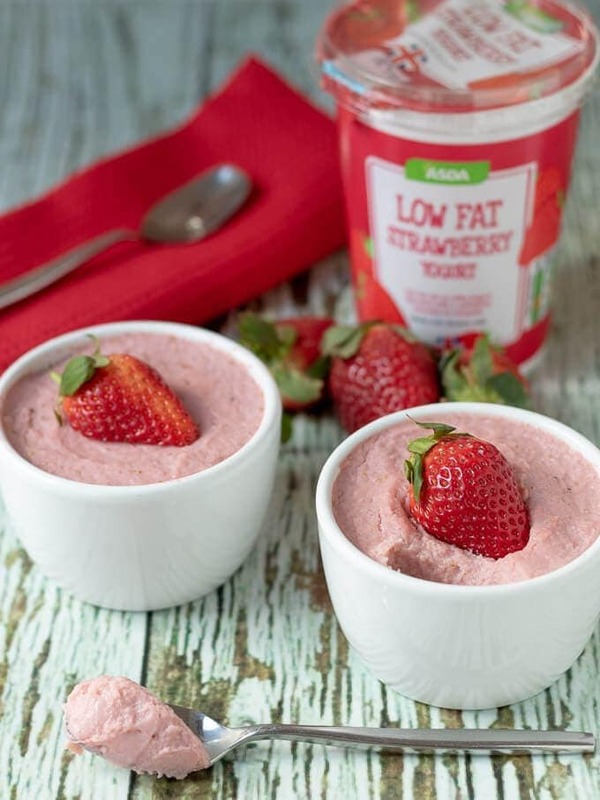 Strawberry vanilla pudding is a tasty no bake quick and easy pudding. Just 10 minutes to make and a couple of hours to set in the fridge and that’s dessert sorted! 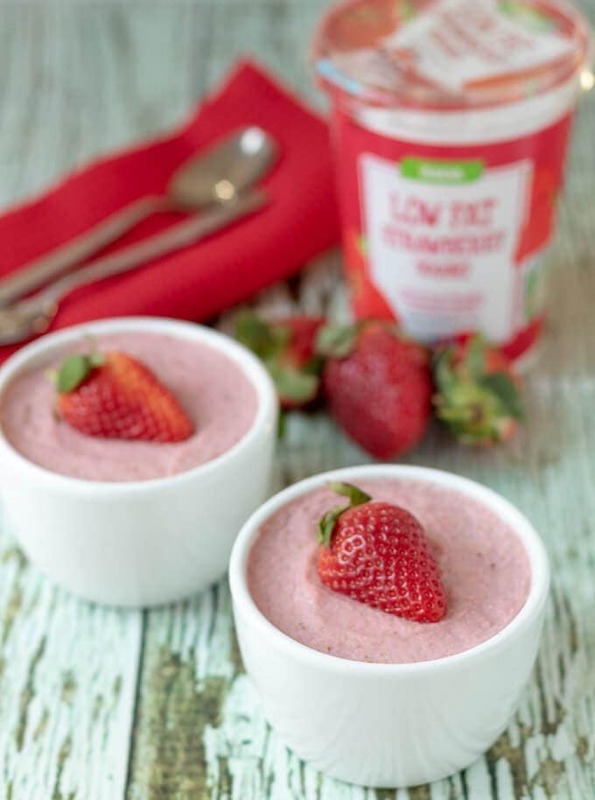 If you’re looking for a delicious but healthier dessert to make and share with your loved one then look no further than this strawberry vanilla pudding. 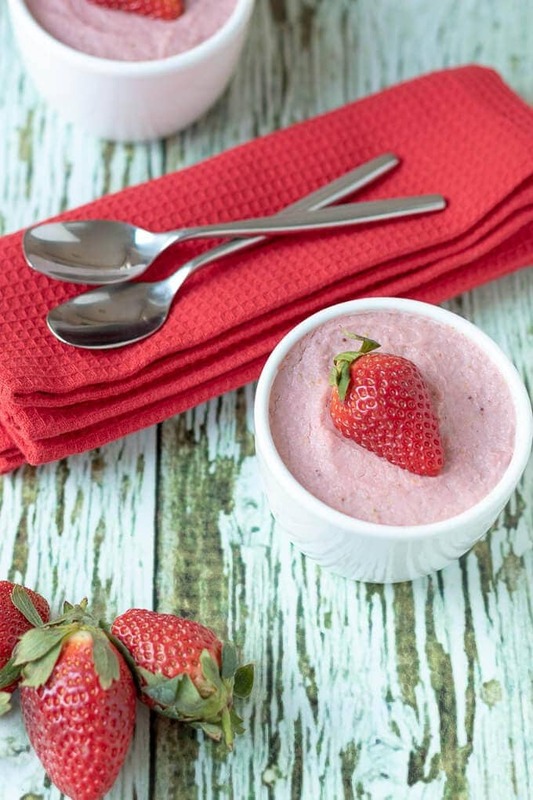 Made with fresh strawberries this valentines dessert is sure to be a hit. This sweet treat is perfect for dessert tonight or in fact any night! Now if you don’t have time to make this so it has enough time to set in the fridge, (approximately 2 – 3 hours) no problems! You can actually eat this hot. Straight away after cooking. So it’ll just take you 20 minutes, including prep time. Lady Lynne and I have eaten this strawberry pudding both hot and cold. And loved it either way! If you missed Tuesday’s recipe, I posted a fantastic Healthier Moussaka. Check it out! So the idea with bringing you this strawberry vanilla pudding today is that this is the dessert to come after that main course. A complete valentines meal for you. If you have the time, make this pudding first. So it has time set in the fridge. Then get on with prepping and cooking your Moussaka. Strawberry banana Valentines pancakes are delicious easy to make pancakes which are perfect for Valentines Day. Why not surprise your sweetheart with these sumptuous Valentine pancakes this Valentine’s Day or indeed any day of the week? Strawberry valentines pancakes are light and fluffy and so easy to make. Just 4 ingredients and 20 minutes is all you need to surprise your loved one with this healthy brunch on valentines day. Folks, I hope you enjoy this recipe whether you have it for Valentines day or not! Next week I’m bringing out the slow cooker to bring you a slow cooker beef curry that is absolutely delicious. We love having it on a leisurely Sunday when we’re just pottering around and it’s simmering away in the kitchen throughout the day. Making the whole house smell AMAZING! 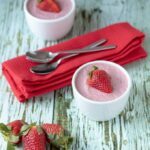 Served hot or cold this strawberry vanilla pudding recipe is one you’ll be making time and time again! 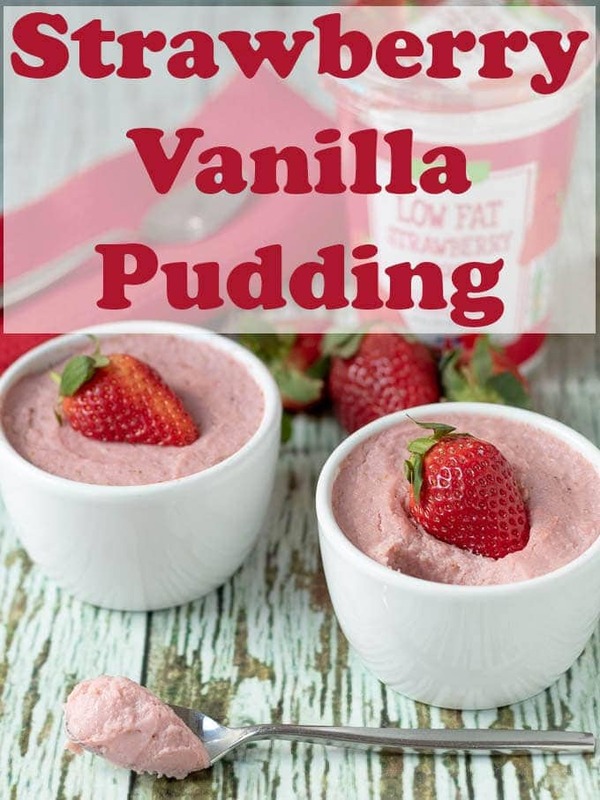 Strawberry vanilla pudding is a tasty no bake quick and easy pudding. Just 10 minutes to make and a couple of hours to set in the fridge and that's dessert sorted! Put the milk and strawberries into a blender and blend together until pureed. Put the semolina flour and strawberry milk mixture together into a saucepan. Heat the contents of the saucepan gently, stirring continuously until thickened and to avoid any lumps. When the liquid has thickened remove the pan from the heat and stir in the vanilla essence and strawberry yogurt until also thickened. Divide the contents of the pan between four small serving ramekins and refrigerate for at least 2 to 3 hours. Remove the strawberry vanilla pudding from the refrigerator at least 20 minutes before serving and decorate with the half strawberries. I love a good pudding! But you know what’s funny? I don’t think I’ve actually had pudding in years. I need to fix that problem for sure. Lucky for me, this recipe is super easy. In fact, I might just have to whip it up for a fun dessert tonight. Thanks for sharing, Neil! Interesting that I’ve never been a huge fan of strawberry desserts and yogurt. However, my taste has changed lately, and now I’m a huge lover of strawberry ice cream…of course it must not have that horrible artificial flavour. 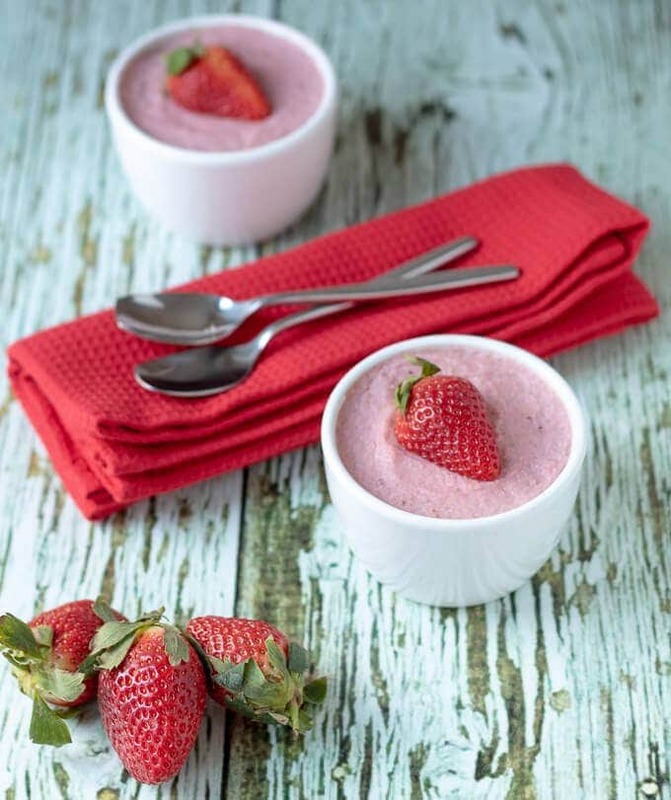 Love this quick strawberry pudding. Also, semolina is an interesting ingredient. I assume it is not fully dissolved, but gives that silky and dense texture? Ha ha, Ben you’re a lover of all ice creams arean’t you? And quite right too! But yes as long as you use fine semolina, as I have in this recipe, then the texture is thick but smooth. Neil – this looks so lovely, and I can almost taste the fresh strawberry! I’ve never thought of strawberry pudding, but I this is making my mouth water. Thanks for the healthy dessert idea! I love this dessert idea. I would never think of using semolina this way but it’s a great idea, definitely worth trying. I would just use almond milk instead of skimmed milk, that would still work, right? THIS sounds like my heaven Neil, seriously! I adore vanilla so so so much, and strawberries were my favorite fruit! It’s just a delicious little treat GiGi and the vanilla gives it that natural sweet flavour that just compliments the delicious sweet strawberries even more! Totally a fan of recipes that are nearly effortless and the end result is absolute deliciousness! In love with this pudding.